The aurora borealis and aurora australis—the northern and southern lights—are visible manifestations of a connection between the Sun and Earth. Blasts of energy and magnetically charged particles from the Sun are constantly flowing out into space and crashing into the magnetic fields of Earth and other planets. 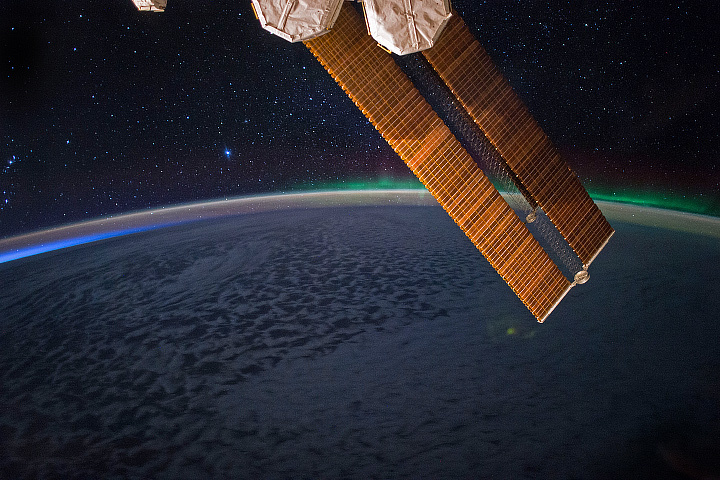 At Earth, that energy stirs up the particles and energy trapped in Earth’s space, or magnetosphere, creating the auroras and disturbing the upper reaches of our atmosphere. 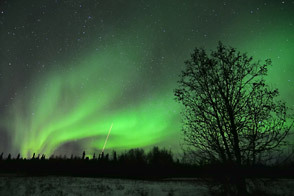 Photographers captured these digital photos of a four-stage Black Brant XII sounding rocket and the aurora borealis (inset) on December 12, 2010, during the NASA-funded Rocket Experiment for Neutral Upwelling (RENU). 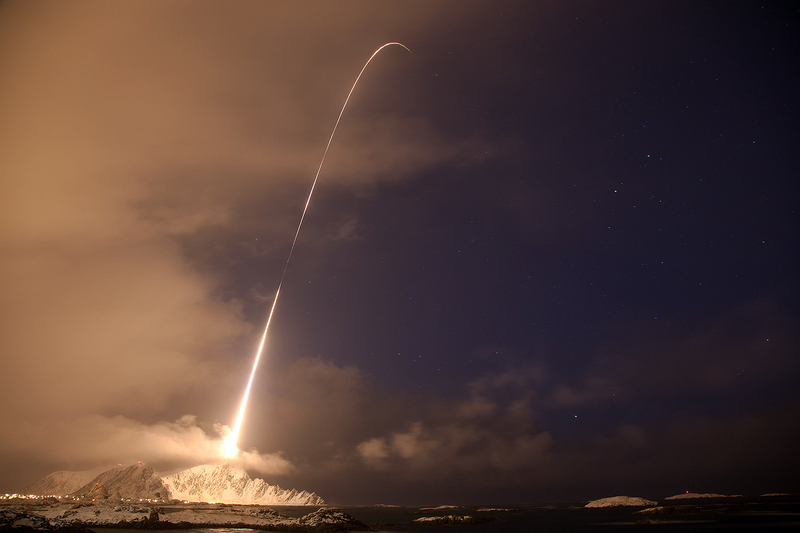 The rocket was launched from Andøya Rocket Range near Andenes, Norway, and carried instruments about 200 miles (320 kilometers) into the atmosphere to observe the aurora and the associated flow of heat, particles, and electromagnetic energy. The photograph of the aurora was taken from the Kjell Henrickson Observatory in Svalbard, which was under the apogee, or peak, of the rocket’s arc through the sky. The rocket landed in the ocean about 900 miles (1450 km) from the launch site. 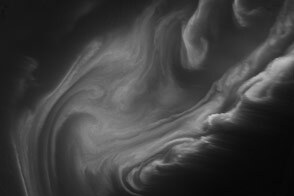 The goal of RENU was to measure the flow of particles and heat both into and out of Earth’s upper atmosphere near the North Pole during an auroral event. The solar wind stirs up Earth’s magnetic field and creates electrical currents in the ionosphere. Such disturbances can also heat the atoms of the thermosphere and other atmospheric layers, expanding them and creating extra drag on satellites and spacecraft, shortening their lifespan. Around Earth’s poles, the magnetic field stretches out from the core of the planet into space and tucks back in at the opposite pole. The place where most of those field lines bunch up poke out of the Earth usually aligns in an auroral oval, where particles and energy from space precipitate and smash into the oxygen and nitrogen in the atmosphere to make the reds, greens, and whites of auroras. The funnel-shaped area inside that auroral oval—the polar cusp—is mostly open to space. 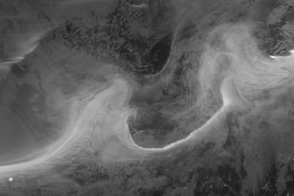 RENU launched right into that cusp region to observe the flows of particles and energy both inbound and outbound. The ground-based photograph of the rocket was taken by Kolbjørn Blix Dahle of Andøya Rocket Range. 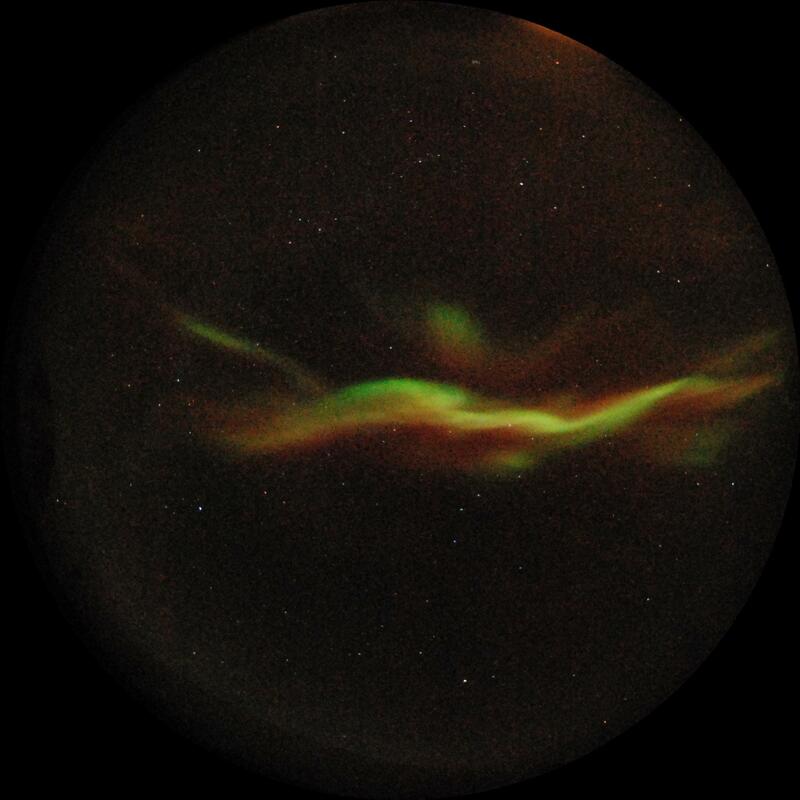 The inset photo of the aurora was taken by Fred Signeres of The Kjell Henrickson Observatory. Caption by Michael Carlowicz. 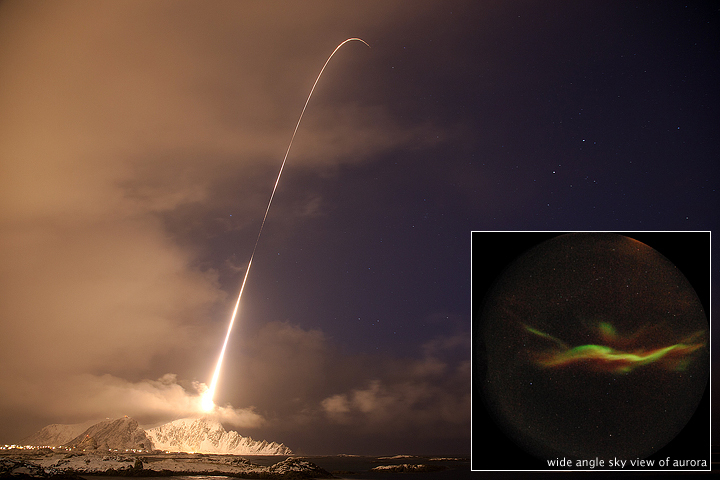 Photographers captured these digital photos of a four-stage Black Brant XII sounding rocket and the aurora borealis on December 12, 2010, during the NASA-funded Rocket Experiment for Neutral Upwelling (RENU). Andøya Rocket Range (2010, December 12) Sounding Rocket Campaigns: RENU. Accessed January 3, 2011. Kjell Henrickson Observatory (2010, December 12). The Waiting Game. Accessed January 3, 2011. University of New Hampshire (n.d.) Magnetosphere-Ionosphere Research Lab. Accessed January 3, 2011. 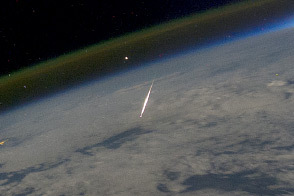 University of New Hampshire (2010, December 13) UNH-Led Experiment Hurtled Into Aurora Above Norway By NASA Rocket. Accessed January 3, 2011.